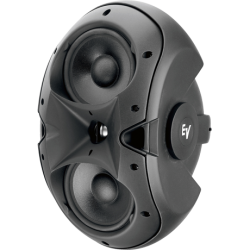 EVID 3.2Dual 3.5" 2‑Way Surface-Mount LoudspeakerFeatures :Ultra-compact full rangeIdeal for restaur..
EVID 4.2Dual 4-inch two-way surface-mount loudspeakerFeatures :Compact full rangeIdeal for restauran..
EVID 6.2Dual 6-inch two-way surface-mount loudspeakerFeatures :Compact full rangeIdeal for shopping ..
EVID C10.110" High‑Power Ceiling SubwooferSupplemental LF for ceiling systemsHigh-excursion woofer i..
EVID Compact Pendant-MountCompact Pendant-MountThe EVID Compact Sound speaker series continues the E..
EVID Compact SoundCompact Full-Range Loudspeaker SysteFeatures :Subwoofer:High-performance EV-engine..
EVID FM6.26" 2‑Way Flush‑Mount LoudspeakerShallow profile, ideal for tight wall or ceiling spacesTun..
EVID-PC6.26½" 2-Way Ceiling SpeakerHigh-performance EV-engineered compression driver. Ultra-wide HF ..
EVID-PC8.28" 2-Way Ceiling SpeakerHigh-performance EV-engineered compression driver. Ultra-wide HF d..
EVID-S10.1D2x10" Subwoofer CabinetTwo 10 inch high-excursion woofersCarefully engineered for outdoor..
EVID-S12.112" Subwoofer CabinetHigh-excursion 12" woofer with dual voice coil to accommodate L &..
EVID-S4.24” Cabinet 8Ω PairInnovative mount system is included for quick, simple, and reliable insta..
EVID-S4.2T4” Cabinet 70/100V PairInnovative mount system is included for quick, simple, and reliable..
EVID-S5.25” Cabinet 8Ω PairInnovative mount system is included for quick, simple, and reliable insta..